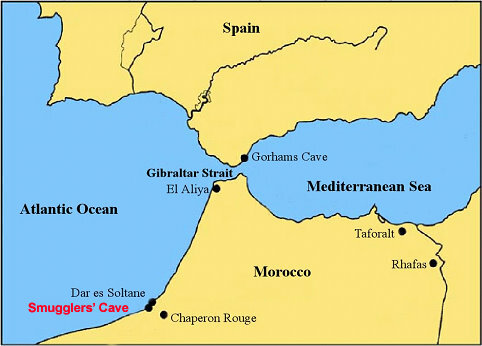 The site of Smugglers’ Cave (grotte des Contrebandiers) is located on the Atlantic coast of Morocco, along the coastal highway connecting Rabat and Casablanca. The cave site is 270 meters from the ocean and 14 meter above the current high tide. The cave is formed in the ancient coastline sandstone and its formation by wave action probably dates back to about 125,000 years ago. After the sea retreated it gradually was filled with sediment and in those sediments remains of at least four archaeological cultures were found. These are the Mousterian in the lower layers, the Aterian, the Iberomaurusian, and finally the Neolithic in the topmost layers. The cave was discovered in 1955 by Abbé Jean Roche who organized the first excavations in the 1950s. Since that time four different teams have excavated at the site including the our excavations which started in 2007. The site is best-known for the important human remains it yields from the Aterian. This particular archaeological culture is interesting because it dates to the time period (between 60 to 100,000 years ago) when modern humans lived exclusively in Africa. In other words, better understanding these early humans might provide insights into human adaptations that ultimately led to the dispersal of humans throughout the globe. The second reason this period is of particular interest is because it is during this same period that archaeologists think modern human behavior develops. In addition to the human remains found at the site, the site has also yielded stone tools from all four archaeological cultures at the site, bones of the animals that probably served as food for the different human groups living at the site, shellfish (again a source of food), and ceramics from the Neolithic (the youngest of the set of occupations at the site). Other archaeological traces include the use of fire during the Aterian, and the digging of pits during Iberomaurusian and Neolithic times. Even though we can guess the ages of the various cultures found at the site through comparisons with other sites were similar material was found, there are no reliable direct dates from the site itself. Earlier some carbon 14 dates were obtained, but the results are inconsistent and therefore new dates are needed. Re-dating the site is one of the major research goals of the current excavations. Other goals include the reconstruction of the environment at the time of the various occupations at the site, the reconstruction of the diet of the peoples living in the cave, the role of stone tools in these ancient cultures, and the integration of our collections with those from previous excavations at the site.